I received this item and compensation in order to facilitate my review. All opinions are my own. I never realized before becoming a parent just how important a bib was going to be in my daily life with kids. At first, I bought bibs because they were cute and totally finished an outfit. I quickly realized that bibs were an absolute must have item that needed to perform the function of keeping my little one’s shirt clean and dry, and it needed to perform that function very well. Now you might be thinking there’s not much to a bib and that all bibs are pretty much the same. I’m here to tell you that this simply is not the case! Not all bibs are created equal, and the Rico Double-Sided Terry Cloth Bib from Baby Travel Inc. is in a league of its own. This bib is changing my opinion of what a bib should and could be! I’m finding myself ditching the full sleeve PUL/waterproof bib and opting for this Rico terry cloth bib for Petit Prince more and more. Here’s what you need to know. The Rico Double-Sided Terry Cloth Bib is made with 100% cotton. The terry cloth material is thick and absorbent and features a fun polka dot design on both sides. There are cotton ties at the back of the bib’s neckline to secure the bib on baby. The edges of the bib are nicely finished with a cotton trim. On the front of the bib, there’s a woven cotton panel that goes across the lower half of the bib. In terms of overall coverage, the Rico Double-Sided Terry Cloth Bib is long enough to cover a baby and a toddler’s whole torso, and it extends nicely over the shoulders and upper arms. Designed in Germany and made in Portugal, the Rico Double-Sided Terry Cloth Bib is a high quality, well made, and durable bib. The Rico Double-Sided Terry Cloth Bib is available online at Baby Travel Inc. If you haven’t had a chance to check out Baby Travel Inc., I really think you should! This is a new online shop for the best baby and mom gear for families on the go! Founded by Echo & Samantha, they saw the need for a place where parents could find products that are absolutely safe for babies, trusted by parents, and make life with your little ones so much easier. 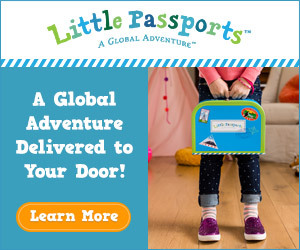 Whether you’re planning an intercontinental holiday with your whole family or just hoping for a mess free meal time at home, you’ll find products at Baby Travel Inc. to help make life with baby fun, easy, and convenient! The Rico Double-Sided Terry Cloth Bib, like every item they bring in, has been independently tested for compliance with US CPSC guidelines and is 100% safe for mamas and babies. My bib experience with Petit Prince has been pretty standard. I’ve opted for full sleeve bibs with the coverage of an art smock that are waterproof and ideally have a pocket. Look, babies and toddlers are messy, there’s no denying that, but you know what’s worse than a messy baby or toddler? Cleaning a messy bib. Stay with me a minute here. We’ve all been there. Your little one has smeared some indescribable purée all over the shoulder of the bib, there’s milk or soup pooling in the pocket, and they’ve wiped their berry covered hands all over the front of the bib. If you’re really lucky, that waterproof pocket might even be dripping a little something through the seam. All around, it’s really fun. Washing bibs has never been my favourite past time. These bibs usually get dropped into the kitchen sink with the dishes from the meal, wiped down with the dishcloth, and hung to dry over the sink faucet where they wait, ready to be used again. After a day or two, that bib is stained, crusty, and smelly. Into the wash it goes where that delightful velcro closure catches on the other laundry leaving thread pulls and fuzzy spots on whatever else was fortunate enough to get caught in the same load. Unfortunately, going bib-less is simply not an option, so I’ve just lived with not loving Petit Prince’s bibs. The Rico Double-Sided Terry Cloth Bib is different. First, it has ties at the back of the neckline to secure the bib to Petit Prince. Toddlers are strong, many are stronger than velcro. A bib ripped off at the table and thrown onto the floor by a toddler is a bib that little one is going to put up a huge fuss about putting back on. With the tie up closure of the Rico Double-Sided Terry Cloth Bib, Petit Prince absolutely cannot get it off by pulling at it. Once it’s tied on, it’s on until I untie it. It’s brilliant. As a bonus, there’s nothing rough to get caught on other things in the wash. Speaking of washing, velcro closures tend to lose their grip after multiple washes making them easier and easier for a toddler to open the more use they get. The tie closure never loses its strength no matter how many times you wash it. The great thing about the Rico Double-Sided Terry Cloth Bib is that instead of repelling and catching wet messes, it absorbs them. Because the cotton terry cloth is so nice and thick, it absorbs spills quickly and moisture doesn’t press through to the inside of the bib. Petit Prince has decided it’s fun to lift his cereal bowl and drink the milk from it before he even starts eating the cereal. It should come as no surprise that he is far from mastering this milk guzzling technique, and most of the milk ends up on him rather than in his mouth. The Rico Double-Sided Terry Cloth Bib has no trouble absorbing that milk right up. The milk doesn’t have time to roll down and off the bottom of the bib before it is soaked up. I love how soft the Rico Double-Sided Terry Cloth Bib is on Petit Prince. As the weather finally warms up, Petit Prince will sometimes be hanging out in just a diaper. When it’s meal time, I just throw the bib on him and he’d good to go. Unlike the waterproof bibs that are cold, scratchy, or sticky on his bare skin, the Rico Double-Sided Terry Cloth Bib is soft and cozy. The Rico Double-Sided Terry Cloth Bib is so easy to wash! Instead of trying to clean it with the dishes, I just toss it right into the wash. I have a load of laundry going almost every day, so it just gets tossed in with the laundry, moved into the dryer, and it’s ready to be used again in no time. I do all my machine drying on low temperature, and the Rico Double-Sided Terry Cloth Bib hasn’t shrunk at all. I have noticed that the terry cloth has a couple of small thread pulls in it after quite a bit of daily use. If I were so inclined, I could pull them back through, but I haven’t bothered. How about stains? I can tell you that both ketchup and mustard have washed out of the Rico Double-Sided Terry Cloth Bib with ease. Overall, it’s pretty resistant to staining. I simply spray with my regular stain remover, and wash as normal. There is one tiny stain that hasn’t washed out, and it’s on the strip of woven white cotton towards the bottom of the bib. It has faded with each wash, and if it bothered me, I could lay it out in the sun after washing and I’m certain it would disappear. The Rico Double-Sided Terry Cloth Bib would have made a great drool bib for Petit Prince when he was teething his first teeth. I was always on the hunt for a very absorbent bib for him because he drooled a lot when he was teething. When I say a lot, I mean A LOT. It was… damp. The thick and absorbent terry cloth of the Rico Double-Sided Terry Cloth Bib is perfect for those super drooling teething babies. It will keep your little one’s outfit dry no matter how much drool is flowing from their tiny mouths! I never thought I’d give up my waterproof pocketed bibs, but the Rico Double-Sided Terry Cloth Bib has completely changed my opinion on bibs. I love that it absorbs rather than repels and collects liquids. It makes clean up much more pleasant for me. As a bonus, because it’s a soft terry cloth, you can even use the bib to wipe up baby’s face before tossing the bib in the wash. Petit Prince is getting to the age where he doesn’t want to have to wear a bib. If he can pull it off, he will pull it off. The Rico Double-Sided Terry Cloth Bib is one he really can’t remove. Once I’ve tied it on in the back it’s on and he’s not getting it off. I only wish I’d had this bib sooner because it would have been the ideal bib for Petit Prince’s epic drooling phase. It’s become the work horse bib now and it stands up to the messiest meal times and washes up with ease. I love that it’s made in Europe and it’s clear that it’s a nice high quality bib that’s going to last and last. The Rico Double-Sided Terry Cloth Bib is available to purchase from Baby Travel Inc. for $25 USD. This bib will easily last a baby from teething through toddlerhood, and it makes a great baby shower gift! Baby Travel Inc. has many great babywearing and breastfeeding apparel styles arriving in store now, so be sure to follow them on Facebook and Instagram to be the first to know when new products are available! ← Win Two Tickets to MommyCon Vancouver & One AppleCheeks 150! Do you think this would fit an older child? My 2.5 year old suddenly likes bibs again, go figure! Hi Abigail! Petit Prince is two years old and the bib fits him nicely. I imagine it would fit a 2.5 yr old really well! This bib looks amazing for those messing eating toddlers. Interesting. I would have never gave any bib other than waterproof a second guess but I will definitely keep this in mind while bib shopping in the near future! I really like the design of this bib and how it wraps around the body and even covers the upper arms. You’re right the velcro on most bibs doesn’t work well & sticks to things in the laundry. Our most interesting bib has magnet closures that works great until you try to wash and dry it because it sticks to the inside of the machines! This sounds like a great bib, I love that it is waterproof yet still soft! My kids have outgrown them, but I definitely wish I had a few of these when they were little! Thanks for sharing! That is actually a great looking bib. It looks easy to clean and would wash up easily. Ilike how it isnt huge and draping around. What a great bib! My daughter gets so messy when she eats, especially with all the juicy summer fruits. Love how there’s holes for the arms. This is a fantastic idea. I’m totally getting one for my grandson. A bib like this would have saved many a baby outfit when my kids were little. I was pretty amazed on reading this about the bib, terry cloth material was the norm when my seven were babies, mind that is 25 to 40 yrs ago now. Then I read how they are a German design, so no wonder as that’s where we lived whilst my kids were babies. We even had ones with full sleeves which was nice if the little one had a long sleeve top on. Though for some things a plastic bib was much better – soup for example, these often had a pocket at the front to catch drips etc. I love this bib! Combination of effective and stylish (or darn cute!). This is a really nice bib that looks so cute and really keeps the front of babies top clean. I need to get some of these bibs! I like the ties on this bib you see so many with snaps but you just can’t get the same customize able fit. I love that it is so thick and has the sleeve covers. Crazy where those babies can get food when they eat! This is one cozy bib! Very innovative. I would’ve loved one like this when my kids were little! I love the size of this! So functional! My daughter seems to be the queen of messy eaters, so this would be great for her! I love the design of this bib! And I also love that it’s made from cotton as I prefer more natural fabrics and find them easier to deal with. It’s also really adorable. Great design and features. I like the neutral color too. So many of my kids’ baby clothes would not have stains on them if I had used bibs like these. I like this cute bib. Perfect for baby showers. I like this bib for my next baby.